Minimum wage increases over the next several years will result in 1.8 million job losses, according to a report from the American Action Forum. By July of this year, 22 states and the District of Columbia will have implemented minimum wage increases. In just 2017 alone, wage increases will lead to 383,000 job losses. While the goal of increasing the minimum wage is to increase earnings for low-income individuals, the report finds that the additional earnings transferred from the job losers to the job keepers is minimal. For example, minimum wage hikes are projected to increase earnings by only $6,900, which would be split among all employees affected by the increase. "While proposals to raise the minimum wage are well intended, it is important to consider the negative labor market consequences," the report states. "A 10 percent increase in the real minimum wage is associated with a 0.3 to 0.5 percentage-point decline in the net job growth rate." "As a result, three years later employment becomes 0.7 percent lower than it would have been absent the minimum wage increase," the report states. In just 2017, minimum wage increases will lead to 1,000 eliminated jobs in Vermont to 109,000 job losses in New York. If all future minimum wage increases are taken into account, those job losses increase to 3,000 in Vermont and 433,000 in New York. The report notes that employers usually pay for wage increases by cutting their workforce, raising the price on products, slowing down their hiring, or replacing more productive workers with low-skilled workers. "Unfortunately, it is the lowest-wage, least-skilled workers who pay the largest prices for these consequences," the report states. "While they need those experiences most to develop skills and find better paying jobs, they are the least likely to be able to keep their jobs or find a new one when the minimum wage rises." 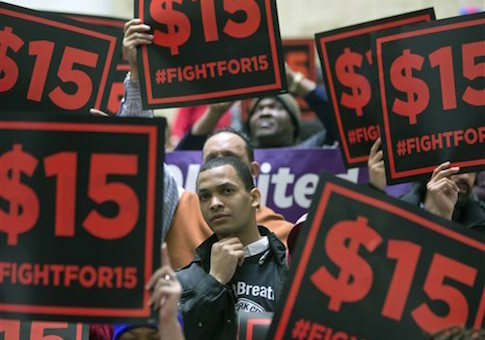 In Arizona, the minimum wage is expected to rise from $8.05 in 2016 to $10.00 in 2017. Critics of the hike there, known as Proposition 206, say it will hurt young people and small businesses. "By making hiring more expensive, Proposition 206 harms young people, small businesses, and folks on the outside of the labor market trying to break in," said Lea Marquez Peterson, who is CEO of the Hispanic Chamber of Commerce in Tucson. "As a longtime advocate for southern Arizona's small businesses, I've seen firsthand the destructive effects of job-killing mandates on job creators." This entry was posted in Issues and tagged Minimum Wage. Bookmark the permalink.